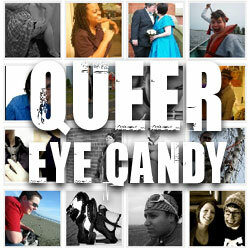 Queer Eye Candy: Call for Submissions! 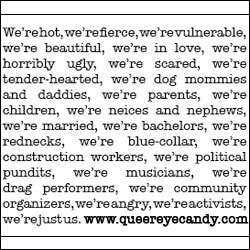 Queer Eye Candy – www.queereyecandy.com – is a community website dedicated to showcasing visual representations of butches, femmes, and all sorts of other queers. We as genderqueers know what it’s like to be out in the world and treated strangely, questioned (“Mommy, is that a boy or a girl?” “What are you doing, this is the ladies room!” “Don’t you know it’s dyke night, honey?”), or constantly stared at as we navigate through our days. We know what it’s like to feel outcast because of the way we look. But what if more people were more used to seeing us, in the wide variety of representation? What if the thousands of ways that butch and femme are reclaimed and performed were collected, so we could see how much variety exists within these identities? And so, our mission of visibility was born. With weekly features such as Wednesday Butch Hump Day, Date Night Thursday, and Femme Friday, Queer Eye Candy showcases all sorts of representation of and from our communities. But we can’t do it without your participation! Here’s the part where we ask you to send in fabulous photos of yourself, your lover(s), your friends, your family. You do not need to identify as butch or femme to participate, though the project does focus on butches and femmes. Submit your high quality, work-safe photographs to [email protected] and go to http://www.queereyecandy.com/submit/ for further information about sending us your photograph. You can also submit photos through the Flickr group at http://www.flickr.com/groups/queereyecandy. We hope to see your smilin’ face on the site. Please reprint this call for images on your blog or message board or community or via your email list! 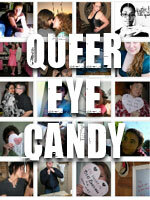 And here are some new buttons you can use to link to Queer Eye Candy in any way you wish. love this! i'll circulate it all over! My girlfriend and I will have to get more recent photos together–we didn't get a lot last time she was in town, as one of us was sick (alternating, for fun!) the whole time. I joined the flickr group to remind me, though.